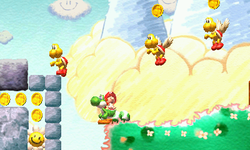 Koopa Canyon is the first level of World 2 found in Yoshi's New Island. Yoshi starts in a rocky area with Koopa Troopas and Koopa Paratroopas, with some slabs of rock falling down upon contact. A nearby door leads to an area containing the Checkpoint Ring and two Metal Guy-spawning pipes, which can be used to create Metal Eggdozers which break through the rock guarding an entrance to a nearby door. Behind this door are some falling rocks and the Goal Ring. This level is very similar to Visit Koopa And Para-Koopa from Super Mario World 2: Yoshi's Island­. This page was last edited on April 15, 2019, at 12:04.